Ferrari by Acer is a series of notebooks with a design praiseworthy of the Ferrari name. The notebooks are made from carbon fiber, which is both light and stronger than aluminum; the interior has a rubber coat, trying to create a similar look to that of the Formula One tires. Not only good to look at, but also highly productive, this series include full features and specifications. 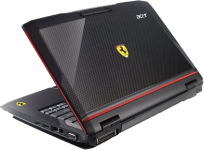 An upgrade in memory will give your Ferrari notebook the extra kick.